The modern publishing industry has never been as splintered as it is today, with authors finding success through a number of channels – traditional big four, small press, self-publishing, crowdfunding, putting work out for free through sites such as Wattpad or blogs to gain a following, etc. The playing field is wide with more and more responsibility being placed on the creator – no matter the avenue they take – to promote themselves and sell their work. There has never been a better time to experiment, and there is no wrong way to pursue your dream. Sound lofty and overly optimistic? Perhaps, but let's dig in. I'm a huge supporter of crowdfunding. I'm one of those who scrolls through Kickstarter every few weeks looking for new and exciting projects. Whether it's J. David Osborne with Broken River Books or his own personal work, or one of the many comic projects that caught fire over the last year – BLACK, Tephlon Funk!, Enforcer: Tough Luck, Sherbet . The display of passion, ability, and professionalism drives me to support these creators. And it's pulling in established pros and publishers too, like Sean Gordon Murphy, one of the top artists working today, and his art book, Under the Hood. Ragnarok Publications found success with Kaiju Rising and Mech: Age of Steel. Former White Wolf employees continue the success of the Vampire/World of Darkness books. The list goes on and on. Over the last few years I've thought long and hard on running a campaign through Kickstarter for one of the comic mini-series I've had in development, but more than anything (especially considering living in a small condo in Boston with a wife and two small boys) the potential for a logistical nightmare – printing/storing/shipping/damaged books/returns/etc – always gave me pause. Enter Inkshares. In late 2015 my local independent book shop, Papercuts J.P., sought to publish a collection of work from authors (both local and from afar) who supported them over their first year of business, including the likes of Paul Tremblay, Christopher Hedges, Catie Disabato, Stona Fitch, Abigail Thomas, (and me!). 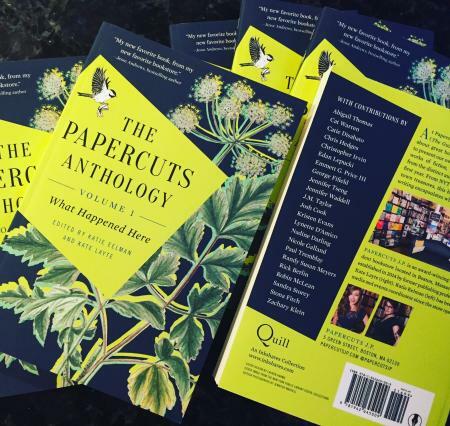 The Papercuts Anthology: What Happened Here, Volume 1 kicked off on Inkshares and found an immediate audience. Inkshares functions similar to Kickstarter in that the books are crowdfunded, however the funding is done by copy (print on demand with limited physical distribution and marketing at 250 copies, offset printing and the full traditional publishing experience at 750 copies) instead of dollar amount, and a cap (10) is set on the number of copies one can purchase, thereby avoiding some of the "vanity press" pitfalls of crowdfunding where an author can potentially fund the entirety of their work. They also provide editing, marketing and distribution, like any other medium/large publisher. The site provides space to upload sample chapters, update readers, and customize rewards for supporters. I loved the concept (especially the fact that Inkshares took care of my logistical concerns of running a campaign with Kickstarter), but I filed it away for future reference. Winter hits and I'm deep into a new comic miniseries and developing the first draft of Wrestletown. Fast forward to late spring 2016. I'm in Papercuts J.P. to pick up a couple books and I'm chatting with the owner, Kate Layte, about Wrestletown. I've received some very kind feedback from agents, but the book isn't mainstream enough for them to run with it. Wrestling is a difficult sell, and it doesn't fit a clear genre. Hell, I'm not even sure how to articulate exactly where it belongs along the usual 'genre lines.' Kate brings up Inkshares as a possibility and we kick some ideas around. I chat later with Katie Eelman, event coordinator for Papercuts J.P. and co-editor of What Happened Here, and the idea continues to grow. I'd always visualized Wrestletown as a sort of comic book in my mind (almost writing an outline to transition it to a comic script when pitching the novel went south). What if I go half-way? I'm a big fan of illustrated novels – Christopher Golden and Mike Mignola's Baltimore is a favorite example of mine. A few texts and emails later, with a little luck and good timing, Andrew MacLean (Head Lopper) is in to do the cover and illustrations. I'm a huge fan of Andrew's work and I couldn't be more thrilled to have him bring Wrestletown to life. So what's this Wrestletown all about? 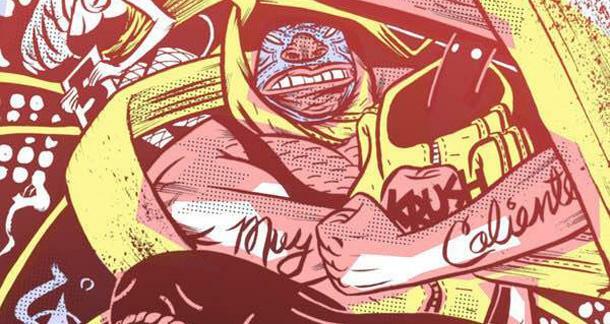 In many ways, Wrestletown is my love letter to nostalgia – the wrestling/comics/manga/anime of my youth, and the new books and shows I'm enjoying now. It touches on some serious issues (i.e. today's obsessive, uncompromising fandom) but at its heart it's an adventure. If you like Ringside or One Punch Man, you'll like Wrestletown. Orphans and best friends Motoko and Reg live in the crumbling attic of a cathedral-turned-pub in Wrestletown, a city obsessed with pro-wrestling, where the heroic wrestlers are worshipped as unbeatable gods, and everyone believes the action is real – that is, except for twelve-year-old Motoko, whose mother stole her innocence after her father, an unnamed wrestler walked out. The long-running head of The Ministry, The Booker, has died and it’s Kid Muscle, his adopted son’s turn to rule from Turnbuckle Tower, ushering in a new era of wrestling – one secretly planned to be fraught with conflict. When Motoko and Reg are saved by the Grand Champion, Amadeus Carp, after an attack amid the parade of champions, they are gifted front row seats to witness Carp’s first ever loss to The Revenant, a mysterious woman with ties to forgotten days of wrestling lore. With the former champion out for revenge, Motoko and Reg’s fierce loyalty will be tested as the city tilts on the edge, ready to explode. DIG IT!? See you in Wrestletown! Get Your Ducks In A Row - Finish the book. Get a knock-out cover (or at least an image that grabs the eye). Have a marketing plan for how you are going to promote the book. Interviews? Columns? Essays? Blurbs? It might be difficult to get an exact timing down in advance, but reach out to your contacts and at least have an ear to the ground so when the time comes you're ready to roll and reduce the chance of something falling through the cracks last minute. The better prepared you are, the less you'll have to do when the promotion begins. And when it begins, it never ends. Never. Ends. Set Your Timeline - How long do you want to promote your book? How long do you think it will take you to achieve 250 or 750 pre-orders? Most readers support Inkshares projects during the first and last weeks of the campaign. Initial excitement and a push at the end to reach the goal. Makes sense, right? Unlike a service like Kickstarter, there aren't really "stretch goals" that you can use over the course of the project to drive additional support. However, that doesn't mean you can't think outside the box/system (giveaways,etc.) to drive pre-orders. Wrestletown will be running on Inkshares for close to 5 months (a little on the long side), but I'm using the time to hit several conventions during the late summer and fall months. Remind, But Don't Annoy - I'm constantly saving links on my phone for articles, books, etc., that catch my eye, but even these often get pushed to the wayside due the million other things going on everyday. I'm always happy when something pops up for a second time in social media as a reminder, and I generally think others are as well - to an extent. Just because you have license to remind, doesn't mean you should be mass-spamming your friends list every week begging for their support. Be smart and use common sense. Leverage The Inkshares Community - Like any online community, Inkshares authors and readers are a great resource for promoting your project. Participate in the community - check out other books, leave reviews, make recommendations and use it for a sounding board. There is a lot to learn from both new and experienced writers. I have put my money in and ordered my copy and I also have read the first 5 chapters and straight up adored them. A lot of the times I'll hear really cool pitches like Wrestletown but be let down by the actual execution; this read even better than the already super cool premise. I need this book to happen, how can anyone not? You're welcome, Jose. Hope you check it out. You're right about these views. It is good to share your ideas about these brands. I read from https://www.essaywritingland.com/buy-essays-online/ here about the different ideas related to the Wrestletown. Thanks for sharing your views here. Really such a nice project he has done "Wrestletown". I'm impressed with him. Thanks for sharing this post, i like the brands and the game field. I regularly follow your blog posts, can you upload some conten or post on edubird writing skills. I'm an content writer and i need some content on edubird to improve my skills.